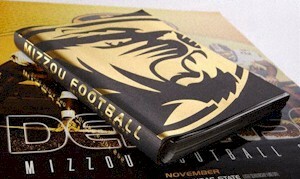 The University of Missouri's 614-page 2004 football media guide pictured in this June 1, 2005, photo in Columbia, Mo., is unofficially the largest in the nation. Starting this coming school year all media guides will have a maximum of 208 pages. 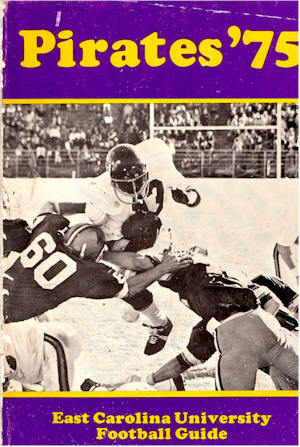 Running back Ken Strayhorn (43) was the star attraction on the cover of the 1975 East Carolina football media guide. The book's modest digest size and black and white content pale in comparison to the current era's lush color-filled volumes. Michigan State associate athletic director John Lewandowski looks over media guides Thursday, May 12, 2005, in East Lansing, Mich. Michigan State will need to cut 92 pages from its media guide to follow a new NCAA rule that colleges trim their media guides to 208 pages for the next school year. 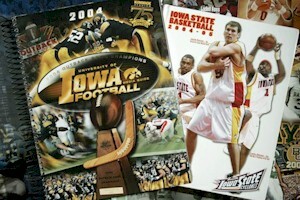 A University of Iowa football media guide, left, and an Iowa State University basketball media guide, right, are shown, Monday, June 6, 2005, in Des Moines, Iowa. Athletic department staffers at Iowa and Iowa State are trying to figure out what to cut and what to keep to bring their guides into compliance with a new NCAA rule that limits their size. In the rough and tumble Big 12, affluent Missouri is always looking for a deluxe edge to impress recruits, while in an upwardly-mobile league like Conference USA, East Carolina is after the same objective but with an eye on the bottom line. The Tigers thought they had found a powerful solution with a mammoth 614-page football media guide — unofficially, the largest in the nation — that is mailed to prospective student athletes. But the NCAA is taking it away with an edict that colleges prune their media guides to a maximum of 208 pages for the upcoming school year. The new rule has sports information directors across the country scrambling to decide what will make the cut when a hundred or more pages in some current guides must be scrapped. And many of them aren't happy. Tom McClellan, Director of Media Relations at East Carolina, notes that the new restraints will also require his office to trim some fat from its media guide. Unlike many of his peers, however, he views the change as an economically sensible step in the right direction. "While I perhaps stand in the minority, I simply welcome and endorse the NCAA's attempt to create a level playing field on this issue," said McClellan in an e-mail exchange. "With that said, please also understand that East Carolina, literally, does not have much to lose with the new legislation to start with." As for the stance of ECU coach Skip Holtz on the new restrictions, it's a non-issue, noted McClellan. "Skip's only request regarding the production of the media guide has pertained to the covers," he said. "He's always been a big believer in rewarding the seniors by placing them on the front and back for added visibility." Schools such as Nebraska and Georgia are faced with the prospect of cutting their football guides in half before the start of next season. Publications go to print this summer. McClellan, who assumed his position at East Carolina after the school's 2004 guide was designed, isn't concerned about the 16 pages he will have to sacrifice in the forthcoming edition. "The folks at ECU who produced last year's book, set at 224 pages, incorporated a lot of 'wiggle room' which can be condensed in an attractive manner," he said. Men's basketball guides are the only other publication likely to be media widely affected by the new regulation, which was adopted last month. Supporters of the rule say restricting the size of the guides will save universities money. It reduces the pressure for lower-income programs to keep up with college athletics' big spenders by producing glitzy guides. NCAA spokeswoman Jennifer Kearns' sentiments are similar to McClellan's. ``It's about leveling the playing field,'' she said. The directive also affects recruiting because the guides often are sent to prospective student athletes. The Bulldogs last year produced a football media guide a little larger than East Carolina's. The size of the 296-page guide was dictated at least in part by a need to avoid being dwarfed in comparison by larger volumes published by Florida, Tennessee and other Southeastern Conference rivals. Many schools devote space in their media guides to alumni in the pros and draft pick histories, although it's not clear how much weight — if any — the books have with recruits. ``It's probably way down the list,'' Nemeth said. Mississippi State expects to save a few thousand dollars on printing costs with the smaller guides, money the department gladly will spend on other projects, Nemeth said. For East Carolina, which has an athletics budget in the range of $18 million, McClellan sees clear fiscal advantages in downsizing the book, including greater flexibility in how resources are allocated. "The most obvious gain from this new development is a significant savings or at least a redirection on spending within a departmental budget," McClellan said. "In my opinion, if it is indeed solely a recruiting piece, there are many other areas which can benefit from added financial resources to enhance the process than an extra 300 pages in a media guide." But the overall cost savings are minor in relative terms for some of the more lavishly-funded programs. 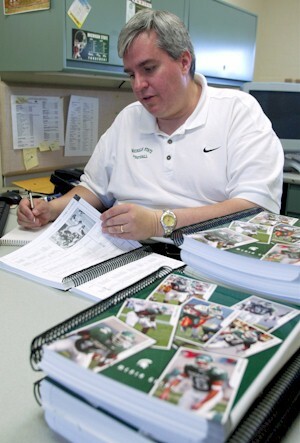 Michigan State, for example, spent about $60,225 last year designing and printing its 300-page football media guide. A 208-page guide would cost about $18,000 less. The Spartans' overall athletics budget is about $55 million. Smaller guides could result in shorter player profiles, abridged records sections or more selective lists of letter winners — a slap to team members, Michigan State associate athletic director John Lewandowski said. ``It's their keepsake, the record of their careers,'' he said. The NCAA will allow schools to distribute some extra information to media members through the Internet or material printed in black-and-white format. But documenting records and milestones in such a way could eliminate some of the cost savings realized through smaller media guides. McClellan observed that East Carolina expects to deploy an enhanced official athletics Web site by late this summer. He indicated the print publication and Web site together will offer more, not less information. "For starters ... we will be adding all of our media guides on-line in the future," said McClellan. " ... If there is something in particular not included in the media guide, it will be available in our game note packages each week, also available on-line." Because of the work of summer intern Thomas Rosenbaum, noted McClellan, the net sum of historical information about the Pirates that will be accessible in one form or another will markedly increase. Rosenbaum "has researched ECU football in great detail and compiled an impressive data base of single-game stat listings for the past 40 years," said McClellan. East Carolina plans to release its media guide the last week of July in conjunction with Conference USA's annual media gathering in Memphis, added McClellan. The Michigan State guide, like many others, lists letter winners from football teams throughout school history. Each season is listed, with game-by-game results dating back to 1896. The guide details every series the Spartans have played, from the 1904-08 matchups with the Michigan School for the Deaf to the century-old rivalry with the Michigan Wolverines. And the book also provides stories relating to tradition, including the tale of how a Lansing sports writer upset with the school's new nickname, ``The Michigan Staters,'' started using Spartans instead in 1926. The moniker, another finalist from a contest to nickname the school, caught on. Michigan's guide documents its string of home games attended by more than 100,000 fans — a streak that began in 1975. In all, five pages are devoted exclusively to facts and highlights about Michigan Stadium. There's also folklore, such as how the school fight song came to be. A Michigan fan was inspired to write the song after the school's first conference championship was clinched with a road win over Chicago in 1898. Dissatisfied with how Michigan fans celebrated in the streets of Chicago, the young man decided the school needed a better celebratory anthem. He wrote ``The Victors'' over the next few days. That's a predictable observation coming from Lewandowski, whose Spartans reside with the Wolverines in the Big Ten, a league populated for the most part by programs where money flows freely. According to the school's official athletics Web site, Michigan's athletics department generated a surplus of $8 million last year and projected a $2.4 million profit for the 2005 fiscal year ending this month. The Wolverines' current budget is pegged at $61.4 million, exceeding even MSU's generous budget by about $6 million. In the end, McClellan contends, the leveling of the playing field in the publications arms race means the battle to impress high school prospects will shift from a "bigger is better" approach to the more equitable arena of computerized design and printing techniques. "Remember, these 208-page media guides will still continue to be produced by experts with cutting-edge technology. In short, it will not come down to a battle of aesthetics," he said. ©2005 Bonesville.net and The Associated Press. Bonesville.net's Danny Whitford contributed to this story. An Associated Press dispatch was used in compiling this report. All rights reserved. This material may not be published, broadcast, rewritten, or redistributed.